A.R. Norris has a new ebook out called LILLY'S JOURNEY. This book was one of the titles highlighted in the new Sci-Fi Romance Quarterly and now the author is aboard The Galaxy Express to celebrate the release with a giveaway! To win a digital copy of LILLY'S JOURNEY, simply leave a comment for this post. Winner's choice PDF, EPUB, or MOBI. If you could journey anywhere in the universe, where would you go? 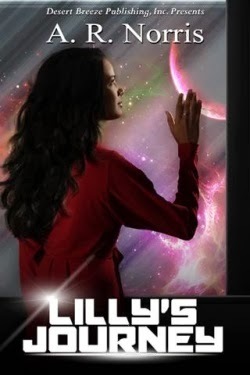 Having just lost her father and her home, Lilly Jordan must venture across the galaxy to her distant aunt. Lilly is ready to face the unknown away from the only place she'd ever been, however, she got more than she expected. All is not how it seems on the beautiful space liner, Gentry II. Now, armed with dangerous information, Lilly Jordan must determine which of the handsome, mysterious men she should trust with the truth, and with her life. Unfortunately one seems bent on vengeance while the other holds her at a suspicious distance.